Compiling a Google spreadsheet replete with statistics and facts to pit Zelda against Mario Bros. in a debate to end debates isn't something you should be doing at work or while you're having a night on the town. But...what if you could print it out so it's ready for your review (or the actual debate) when you get home? 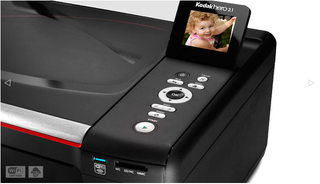 Well, all you need to do just this is send the doc directly to your Kodak Hero All-in-One Inkjet printer from your laptop, tablet, or smartphone using Google Cloud Print. And if you're more of an email person, you can use the easy Kodak Email Print Service to remotely print off emails and other documents. Just import your Hero's email address to your device with a quick scan of the printer's Microsoft Tag, then, send an email directly to your Hero. Either way, you'll be able to print efficiently from upstairs or upstate without so much as a second thought. Click here to find out more about the Kodak Hero All-in-One Inkjet printers as well as their Email Print and Google Cloud Print capabilities. Because if you can't explicitly explain that the Mario franchise is more popular because he is a blue-collar plumber with the ability to overcome height issues, monstrous challenges, and sewage problems, then you'll be as lost as Link is without ocarinas or the Master Sword.